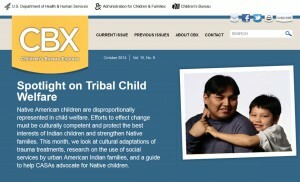 Native American children are disproportionally represented in child welfare. Efforts to effect change must be culturally competent and protect the best interests of Indian children and strengthen Native families. This month, we look at cultural adaptations of trauma treatments, research on the use of social services by urban American Indian families, and a guide to help CASAs [court appointed special advocates] advocate for Native children. See the October 2014 issue at the Children’s Bureau Express website. This entry was posted in News, Resources and Support and tagged CASA, Children's Bureau. Bookmark the permalink.